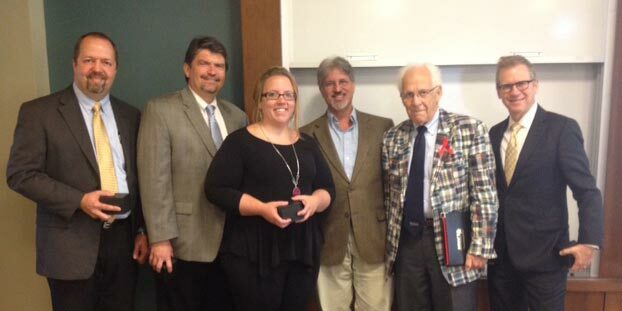 Six Webster University colleagues were recognized at the Sept. 22 board of trustees meeting for their roles in advanced strategic plan goals with the quality of their programs and/or achieving student success through recruitment and retention: Erin Bullerdieck, Michael Cottam, Ted Hoef, Eric Rothenbuhler, Peter Sargent and Bruce Umbaugh. Eric Rothenbuhler, dean of the School of Communications, and Peter Sargent, dean of the Leigh Gerdine College of Fine Arts, were each recognized as this fall their respective schools had the most first-time, full-time flat fee students in five years as well as the most transfer students in five years. Their success is in part due to the development of new programs and solid collaboration with the Office of Admission, as well as summer camps and focused outreach to prospective students and partners. Michael Cottam, associate vice president for Online Learning, was recognized with graduate online enrollment being on budget this year (Summer and Fall 1), and undergraduate online enrollment showing growth over last year. Intentional collaboration with the schools and colleges make this possible, such as with the new General Studies major made available online. Cottam has also led development of WebNet+, a new online modality that has shown significant growth and now involves 25 extended campus locations. Bruce Umbaugh, professor of philosophy and director of the Global Citizenship Program, was recognized for his and colleagues' work to overhaul and redesign the core undergraduate curriculum for all Webster undergrads to focus on key competencies and content. This fall the GCP is being recognized with the Exemplary Program Award from the Association of General and Liberal Studies, through a unanimous vote by the awards committee. Erin Bullerdieck, coordinator of the Transitions program, was recognized for the success of the Transitions summer bridge and year-long intervention program with conditionally admitted students. These efforts have now resulted in the retention success of conditionally admitted students surpassing that of full admits. Ted Hoef, dean of Students, was recognized for leading a team this spring and summer to achieve 99 percent occupancy in student housing on the Webster Groves campus. This goal not only assists the university from a capacity and financial point of view, but also gives students a greater chance for student success since living on campus is positively correlated with students’ success.